Vote for Element on Boardgamegeek.com! Are you excited about Element coming in 2017? We sure are. Now you can share that excitement and anticipation over on Boardgamegeek.com. Nominations are open and Element would love your vote to make it into the top 50 finalists by January 8 when the nominations are closed and finalists are named. Vote for Element in the Top 20 Most Anticipated Games of 2017 poll going on RIGHT NOW! We’re glad you asked! Head over to Boardgamegeek.com and the Anticipated Games of 2017 Geeklist (if you don’t already have a BGG account, it’s FREE to sign up and you can become part of the largest tabletop gaming community online). 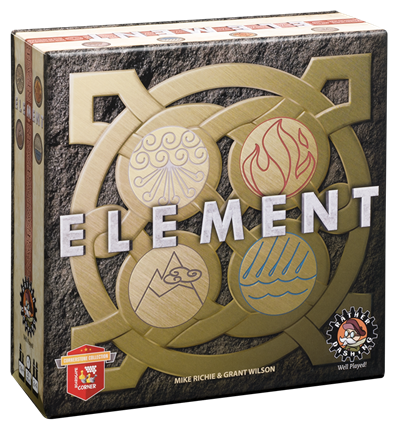 Give Element a Thumbs Up by clicking on the green thumbs up button beneath the game box image indicated in the photo below with the arrow and star. Don’t forget to tell your friends to vote for Element as well! Visit the official BGG page for Element to share reviews, rankings, images, and videos for the game. Do you dream of unwrapping a tome of wisdom this holiday? Maybe you wish you could give a friend a mithril sword. 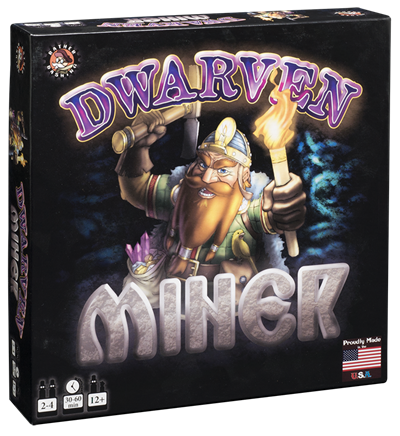 Then Dwarven Miner is the game gift for you (and them)! Compete to craft the most desirable items to win the patronage (and special perks) of powerful dwarves in this game of set collection and card drafting, with some press-your-luck rolled in! Your turn is played in three phases: Mining, Crafting, and Fulfillment. Roll the resource dice to mine the raw materials needed to craft your items. Re-rolls are permitted and you can bank resources and re-roll the undesired outcomes. Watch out for Orcs as they will block your ability to gain resources. Commit your resources to create desirable items such as weapons, armor, other gear. The items you choose to craft will depend upon the patrons you are trying to please from the patron cards in your hand. Unused resources may be saved for future use if you have space in your backpack and/or vault. Fulfill a patron’s desires by having crafted the items required on their card. Gain the patron’s victory points, and trigger their ability. Choose your patron’s wisely and claim your victory points often, they cannot be taken away once scored, and the first player to 30 points wins. Some people want world peace for the holidays, others want to rule the world. This game is for the latter group. What’s a little seasonal bah-humbug amongst friends? Get holiday stress out of your system with some intergalactic warfare in We Come in Peace. Defend your planet from incoming saucer attacks by rolling dice and using your options strategically to counter-attack, rebuild cities, and launch missiles at your opponents. Your defense rolls increase in value each round, but you add more invasion dice as well, so you’ll need to stay alert as if your life depends on it. Played in three rounds, this is a frantic, fun, fast game of exponential chaos. It is as much fun to lose this game as it is to win… as long as you go out in a blaze of glory! They say the best defense is a good offense, and re-rolling for attack missiles instead of protecting your burning planet becomes a very valid game plan. 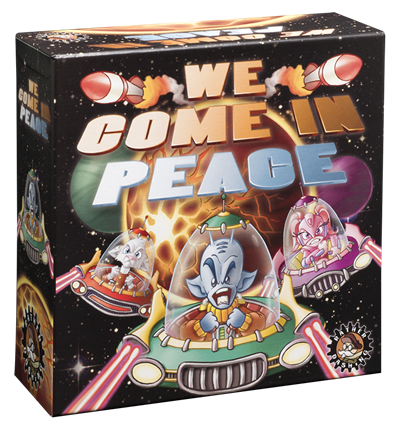 We Come in Peace is ideal for all players ages 8 and up, in groups up to 6 players! Games play quickly in 15-20 minutes, so be prepared to engage with the enemy several times. Tip: Protect and rebuild your planet’s core, its worth the most points at the end of the game if it is undamaged. Visit your Friendly Local Game Store for help finding this game and others in their inventory. Ghosts at Christmas?!? Why of course! Old Ebenezer Scrooge can tell you a thing or two about that. This year why not try to see things from Jacob Marley’s perspective? Today’s “Game Under $20” will let you do that. 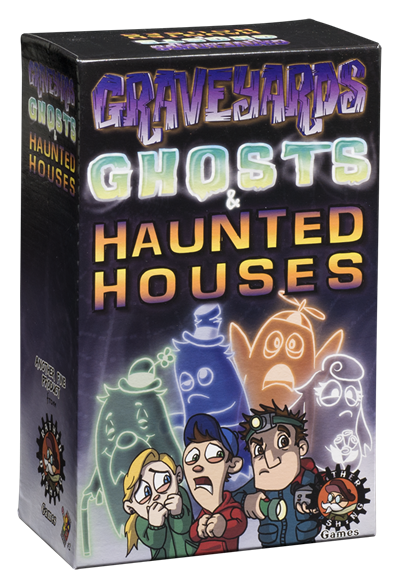 Another game in our Drawn & Quartered series (see Pirates, Ninjas, Robots & Zombies as well), Graveyards, Ghosts & Haunted Houses lets you be the ghost trying to haunt the largest portion of the play space. Place your tiles to connect your sections or block your opponents. Lock in advantageous groupings using your haunted house tile. Play your special tokens to scare meddling kids for bonus points, expose your opponent to a paranormal investigator, or bury a ghost to negate points. After the last tile is drawn, add up your score to reveal the scary spook in the graveyard! This game is for groups of 2-4 players, ages 8 and up, and plays in approximately 30 minutes. Each game plays differently based on how the tiles are drawn and played. Rematches are not uncommon. It makes a great gift for families at a price of $19.99. Order $50 or more in games from our web store by 12/9/2016 and the shipping is on us! Just use code GAME50 at checkout. Another day, another installment in our Games Under $20 series. We told you there were quite a few options! Pirates, Ninjas, Robots & Zombies is the first in our Drawn & Quartered line of tile-laying games. Choose your side and dominate the landscape by spreading your team’s control over the largest connected area. Players take turn laying tiles to connect large sections for their team. Some tiles have icons that confer an additional special action, such as swapping the location of two tiles in play and rotating any tile on the board. You can use those special actions to increase your area or break up an opponent’s section. Use your opponent’s nemesis to neutralize points in their largest section. When the last tile is taken from the draw pile, you get one last chance to maximize your score or cripple your opponents. Find out once and for all who would win the ultimate battle: Pirates, Ninjas, Robots, or Zombies?! 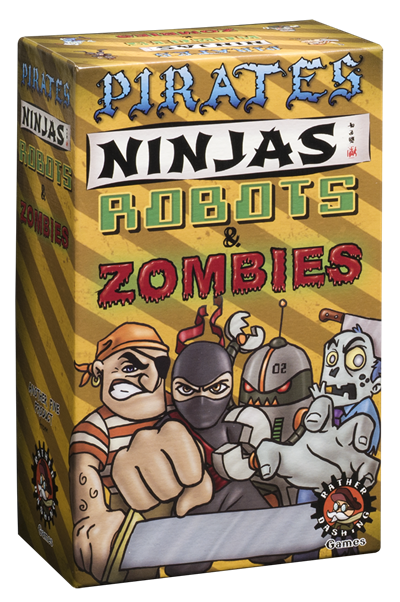 Pirates, Ninjas, Robots & Zombies is recommended for 2-4 players, ages 8 and up, and takes about 20 minutes to play. At the perfect price of $19.99, you can get a copy for your favorite niece or nephew AND one for yourself! Avast! 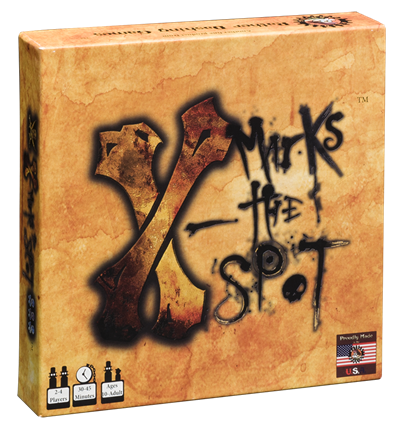 Today’s spotlight for games under $20 is X Marks the Spot! This game is perfect for the pirate enthusiast on your gift list. Channel the cunning of a 19th century pirate in search of treasure. Race the other pirates to create three Xs with your unique pirate flag and claim dominion of the high seas! There is some honor amongst thieves as you take turns placing your tile cards to create a grid system as the play space. You may place cards over top of other cards or portions of cards to achieve your objective. Watch out for the Ghost Ship, Kraken, and Open Water tile cards for strategic tile-laying advantages. Or use action cards like the Cannon which allows you to destroy a card and remove it from the grid. Gather 2-4 players (recommended for ages 10 and up) and spend 30 minutes playing pirates in X Marks the Spot!